Architectural coatings (like paint) make buildings beautiful. Industrial coatings finish products during manufacture at the factory. There are two main categories of paint, defined by their primary constituent. Paints are either water-based or oil-based (solvent-based). Oil-based paints contain a high level of organic solvents. They vent a noticeable odor from open containers and during application. Evaporating solvent causes the paint to dry, giving the paint its texture and finish. OSHA classifies solvents used to manufacture oil-based paints as flammable materials. Solvents used in oil-based paints can also be hazardous due to their toxicity. Adequate ventilation is important during application or while in storage. Water-based paints do not have the same hazards associated with the use of solvents. Their performance was inferior to oil-based paints but technical advances are changing that. Water-based finishes are now comparable to oil-based finishes and more people are using them. Paints also contain additives such as metals, which are hazardous. IBCs and 55-gallon drums are the most common containers for bulk paint supplies. Companies must store these containers safely. OSHA and NFPA are regulatory bodies that define requirements for safe areas or structures for storage. U.S. Chemical Storage supplies paint storage buildings. Their design mitigates the risks associated with storing paints. In addition, they meet all the relevant regulatory requirements. Spills that occur in a paint storage building flow into a built-in secondary containment. This containment is leak proof and protects the environment. Paint storage buildings can be temperature controlled and ventilated. Made with heavy-gauge metal steel construction, paint storage buildings are virtually indestructible. When using a 2-hour or 4-hour fire rated construction design and explosion proof accessories, it’s safe to place within 10 feet of an occupied building or property line. Flammable storage paint lockers keep smaller quantities of paint indoors. Lockers may also contain facilities to mix paints. Forced ventilation keeps harmful vapors from building up. Climate control prevents unwanted evaporation and keeps the paint at an optimal temperature for application. 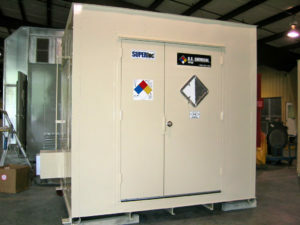 Storage paint lockers also provide built in secondary containment for spill control. They are fire rated for either 2-hour or 4-hour fires depending on specifications. Configure the racks and shelving for efficient storage and mixing practices. Contact U.S. Chemical Storage to learn more about storage of paints or to receive a complimentary quote. Our professional consultants can advise you on the best solution for your application. We are also familiar with regulatory requirements that are relevant to your industry.